Microwave technology is a relatively recent development for processing materials and has novel applications in foundry industry. Any process that involves elevated temperatures such as drying, heating and sintering is energy intensive and there is a need to make the process energy efficient by alternative techniques. Foundry processes are no exceptions. There are specific applications including removal of moisture from sand and core drying that are energy intensive. The former involves removal of moisture and the latter involves complete drying and curing. These processes can be made energy efficient at low costs by using microwave technology without compromising on quality. The advantages are energy efficiency, faster processing time, higher productivity and cost effectiveness with lesser impact on environment. 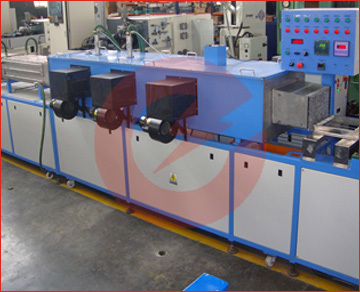 Furthermore, the technology can be implemented easily including for continuous production. In this paper, we briefly describe the principles involved in drying sand and curing sand cores using microwave radiation. The advantages of the method are brought out quantitatively through a few feasibility studies. Enerzi is keen to introduce this technology in foundry industry in the country and is willing to work closely with interested organizations for exploring newer applications. For the benefit of the audience with varied background, a brief introduction to microwaves is given first. The capabilities and expertise of Enerzi in terms of design and development are given. Some details of laboratory and pilot scale systems are elaborated. Data on a few applications to drive home the advantages of the technique over the existing conventional methods are highlighted.